National armies that use AK-47s, the world’s most popular assault rifle, span the globe. Despite the fact that its presence has almost become commonplace, the weapon has been embraced as a symbol of resistance by armed groups and reviled as a symbol of terrorism by superpowers. Perhaps this occurred due to the way the Soviet Union distributed AK-47s to its political allies to stymie U.S. anticommunist ambitions, or because of the weapon&apos;s durability — it continues to function in the harshest of conditions, those in which guerrilla movements seem to thrive. In the early 1970s, Salvador Allende, Latin America&apos;s first popularly-elected socialist leader, was president of Chile. 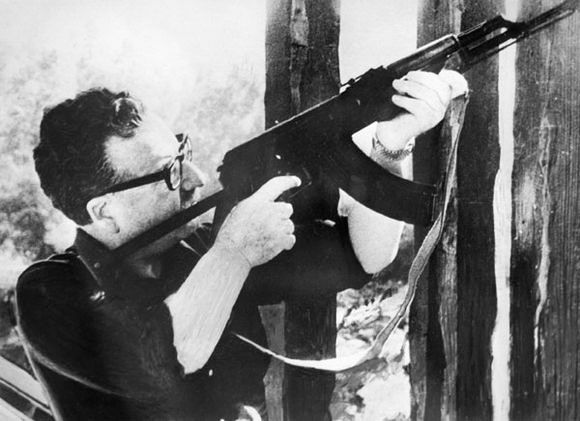 Allende received an AK-47 as a gift from Fidel Castro himself. The Cuban revolutionary included an inscription on the weapon; it read, "To Salvador, from a comrade in arms, Fidel." Castro had survived multiple CIA plots, and the gift may have represented the shared struggle of the two countries against American intervention. In 1973, Allende was overthrown by a U.S.-backed coup that led to a brutal dictatorship. Experts recently confirmed that Allende used the rifle to commit suicide as General Augusto Pinochet’s troops stormed the presidential palace. Saddam Hussein owned a chrome-plated AK-47 featuring a small photograph of him near the front sight and a pearl handle grip. Hussein has been photographed many times while wielding AK-47s and other weapons — the photo above was taken during the Iran-Iraq war. It seems fitting that a man who became president by consolidating divergent military powers should have such a flashy weapon. In Mozambique, the AK-47 is a symbol of the war of independence, and, as such, is featured on the national flag. In 1975, Mozambique gained independence from the Portuguese, in large part due to operations by guerilla forces. Hezbollah, the Islamic militant group based in Lebanon, also features the AK-47 prominently on their flag. The weapon&apos;s barrel is encircled by the words, "Then surely the party of Allah are they that shall be triumphant." The Soviet Union exported the AK-47&apos;s rifle specifications and manufacturing technology to North Korea during the Cold War to help slow the United States&apos; crusade against communism. The North Koreans are masters of propaganda, so it&apos;s not surprising that the weapon should play a role in it. Osama bin Laden’s AK-47 is on display at the CIA Museum at the CIA headquarters in Langley, Va. The weapon is a symbol of the war on terrorism and is a reminder of the violent ideology bin Laden championed. In his many videos throughout the years, bin Laden appeared clutching his AK-47. He used the weapon for his entire career, including during the 1979 fight against the Soviet Union in Afghanistan. Cuba received AK-47s directly from the Soviet Union during the Cold War, and currently employs them in its standing army. Over the course of the Cold War, the Soviet Union gave Cuba $11.5 billion worth of military aid. Photos of Fidel Castro, the country&apos;s revolutionary leader, frequently show him brandishing the gun and harken back to the country&apos;s armed revolutionary roots. Is it surprising that one of the most widely-circulated photos of Charles Taylor, Liberias warlord-turned-president, should show him shouldering an AK-47? Taylor was tried and sentenced to 50 years in prison for war crimes as a result of his involvement in Sierra Leone&apos;s civil war. He fuelled the conflict by extending support to rebel groups. This photo of Ramiro Pozos Gonzalez, a drug cartel leader, posing defiantly with his gold-plated AK-47, poignantly illustrates the violence of the drug trade and the resistance towards Mexican efforts to stymie such violence. Artist Cesar Lopez responded to the violence that has affected his country by "breathing life into instruments of death." In other words, he transformed guitars AK-47s into guitars, and even former Secretary General of the UN Kofi Annan grasped one of the rifles-turned-guitars. Lopez&apos;s instruments symbolize the opposition to violence in Colombia and world wide.